Basically the purpose of this thread is to better educate myself on setting up an FB for HPDE, Time Attack, and Autocross events. I've spoken with a few notable people regarding this, and I've been getting a multitude of answers. I started restomodding my (S2) FB last fall, making very slow progress. Initially the goal was to build a quick street car. S5 TII swap with a big BorgWarner strapped to the side, FC front subframe swap with a manual rack, and a GSL-SE axle out back. Things have changed, I've had a taste of beginner motorsport and I'd like to dabble in it myself. Rather than build my Honda I may as well get my current project setup. I'd like to move forward with the FC subframe swap, though I will consider keeping the FB setup if I can find a way to refurbish my box. After doing research the main issues with the FC setup is of course the poor roll center, stiff spring rates required... so on and so forth. What is everyone here running? the front on an SA/FB is actually the easy end. setup is pretty basic, its a simple car. from stock, it basically needs more negative camber, and stiffer springs. since the rear roll center doesn't change with ride height, but the front does, the front gets lowered a little, but to start with you're basically at the low end of the stock specs. for tires, a 205/45/15 is probably about right, give or take. it'll probably want about -3 degrees of camber, and springs should be in the 250-350lbs/in range. Seriously considering keeping the stock box since so many seem to be recommending easy fixes for it... I'm starting to feel as if the FC subframe swap is more trouble than it's worth considering my goals. Some good tips here. Most definitely adding that to my notebook of FB info! Get the GSL-SE front struts, rotors and calipers. I run a heavily modified 1st Gen (stock tail lights, everything else has been massaged.) I road race it against 3.0 liter Porsche 911 RSR IMSA GT cars. I cut the GSL-SE struts down and converted them to coil overs. I am running 600 lb front springs and 450 lb rear springs. Which ever struts you use, you must run 2" spacers at the bottom of the strut to correct the roll center after you lower the car a lot. Replace the top rubber strut mounts with some adjustable caster/camber plates, not too hard to do. Replace the lower control arm pivot bushings with Delrin bushings. Brakes: I machined the rotors off the hubs, and turned them into hats to accept Wilwood 11.75 x 1.25" thick GT rotors, and I run Wilwood calipers. Brake cooing ducts are a must for repeated braking from 150 mph down to 45 mph at Road Atlanta. Are GSL-SE brake rotors even available from anywhere anymore? I had everything to convert my car except for the rotors, and ended up just putting the FC front suspension in instead. That and I was having a lot of problems with snouts bending or just plain wearing out where the bearings ride, the slip fit turning into an appreciable gap. One of my Eventual Plans was to make a solid spacer for between the bearings so the axle nut could be torqued down. This would put the snout into more of a tension load than a bending one and should have helped life and strength considerably. Never got around to it. Last edited by peejay; 08-06-16 at 05:34 PM. GSL-SE brake rotors are readily available. If you buy Chinese rotors, check axial and radial runout with a dial indicator. I bought one set of Chinese rotors through Rockauto.com, and they did not drill the wheel stud bolt pattern centered on the wheel bearings, so my wheel rotated out of round. Rockauto did give me a full refund when I complained about it. I have never had a spindle break under heavy road racing loads with 11" wide slicks, even when I was running my original 1979 RX-7 small bearing spindles. I don't see a reason to put a spacer between the wheel bearings. The spacer length would have to be exact within a few thousandths to prevent bearing crushing or axial play. Always buy the best name brand wheel bearings you can afford. I may have overloaded yall with information on my first post, but I wanted you to see that a lot can be done with the basic Mazda 1st gen front suspension. No such thing as too much information when it comes to technical experience! I never had issues with *breaking* the spindles on my '80 but readjusting the bearings was a weekly thing. Only thing I don't miss about that car. Those are some cool parts. I did the Turbo II brake swap on mine, and am using the FC hubs. I do have FC spindles though so I may change out the ball joint and run the FC spindles in the future. The MSF Australian spindles are cool, but wow $1450 a pair. The GSL-SE ones seem good enough to me. They are usually available at a junkyard for $100 to $200 for a pair. FB Spindles - even the bigger 84/85 spindles - break. It has happened to several race cars in the KC area. You have to remember that every spindle that is available is a used part with an unknown past. How do you know that the spindles you are going to use weren't on a car that was curb hopped. To protect yourself you can have the spindles magna-fluxed to see if they are cracked. Also, pay attention to the car's alignment specs as you race it. Changes in camber that don't make sense may predict a potential failure. The MSF hubs have received lots of complaints here and I've seen first hand the quality of the machining on the hubs. Many of the aftermarket hubs from other brands also leave a lot to be desired. Check out ACBron Motorsport on Facebook. His adjustable coilovers are the **** and lots of 1st gen racing suspension stuff in the works. Also, GSL-SE rotors are the same as our series 3 (we only got the bigger brakes in 4x114.3). Our main local aftermarket rotor manufacturers DBA and slightly cheaper version RDA both make this in a variety of styles (slotted, cross-drilled etc). DBA is generally better regarded for track use. Check out dba.com.au DBA also has a US specific site dbausa.com, but it doesn't list the full range including all the rotary parts. Shipping from Australia to the US usually isn't that expensive, especially compared with our own domestic shipping and the fact that our currency is so weak at the moment. Also, GSL-SE rotors are the same as our series 3 (we only got the bigger brakes in 4x114.3). After I found out about that, I thought it kind of strange that Mazda would tool up to keep using the "12A" brakes with the larger spindles and rear axles (even making big-bearing drum rearends for two years!) instead of just standardizing on the larger brakes, for the North American market. it is definitely weird. To my knowledge, all of the 84-85 RHD models around the world got the 14" inch wheels and larger brakes front and rear. Our base model was a stripped out "Sport" model with no power windows/mirrors etc and steel wheels, but even that had the bigger brakes. 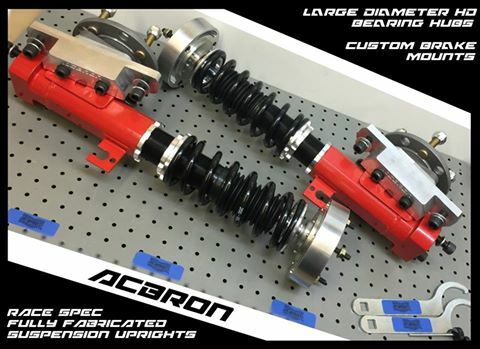 ACBron Motorsport has shown a glimpse of its new unique machined upright with big bearing hubs (bearing is huge). This does away with all the Mazda components altogether. No stub axle at all. Brake caliper mounting system allows infinite upgrade options, including different upgrades over time. Specific FB version will be available soon, which I'll probably be getting on my car. Hubba Hubba! Was just thinking about shooting Adsy a line to see if he would entertain manufacturing a full stub axle replacement. This looks the goods! We should get a group buy together - pressure him into making a whole bunch of them!! it is definitely weird. To my knowledge, all of the 84-85 RHD models around the world got the 14" inch wheels and larger brakes front and rear. the JDM 6 port 12A cars keep the small brakes all the way to the end in 85. the turbo 12A cars get the big, 4x114 brakes. JDM is model independent. they had similar trim levels to the US (GT, GTR, GTX, GT-Limited), but you could get either engine. I saw these when they were just ideas sketched up in CAD, so it's awesome to see them make production. I don't any extra pressure is needed. They are pumping out heaps of stuff at the moment and he knows there will be plenty of demand for these for FBs. Probably got 20+ customers waiting for the FB rear coilovers too. They are very close as well. Thanks for the correction! Didn't realise that. We had 3 trim levels: Sport, Deluxe and Limited. Then there was a limited edition Finale. 95% of cars were Limited, almost all of the rest were Sports (rear spoiler, LSD diff, manual windows, mirrors, no headlight washers, basic stereo, no adjustable lumber support, vinyl interior). Deluxe was basically a Sport plus A/C plus cloth interior - never seen one in my life. All had the same 4 port 12A rated at 85kw / 115hp. It has the taller primary ports. Pretty sure that's the same as the EU one. as far as i know (which isn't that far) the EU got 1 model. it had a 12A with exhaust ports that closed @48 degrees, like the 12AT, and 13B's, and probably your Australian cars, for 110hp. cloth interior, rear wiper, rear spoiler, big brakes 84+, they seem to have an open diff. - no leather-wrapping on steering wheel (this was standard on Limited models in Australia). - FC style oval side indicator lamps on the front guards, below the Mazda RX7 badge - everywhere else in the world go rectangular indicator lamps fitted into the body mouldings forward of the front wheel. - equaliser and joystick was an option, not standard (radio and cassette in Australia and UK was the same Clarion unit fitted to 83 GSLs in the US). UK, like Australia and JDM were 2+2 seaters. European (incl UK) and Australian cars also have the rear licence plate between the taillights instead of the black garnish (JDM and LHD got the black garnish and licence plate fitted to the bottom of the rear bumper cover). Getting off topic I know, but hopefully someone found this useful/interesting. Those AC bron coilovers look really cool. You guys almost make me regret choosing to to go with the FC front subframe swap... Seems as if not many people can comment on proper setup. Too bad I can't find another box. Seems as if not many people can comment on proper setup. I feel as if I've been worrying far too much about the suspension setup with the FC front subframe. It's to my understanding all the tips listed here are for the factory front suspension, not the FC conversion which is where the confusion stems from. Quick Reply: FB Front Suspension Setup?